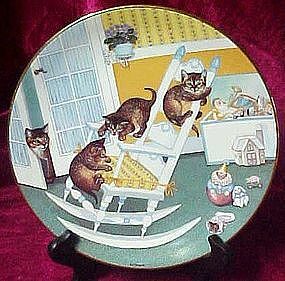 Rock and Rollers is a plate from the Country Kittens plate collection by artist Gre Gerardi. This fine china collector plate has a 23K gold rim and is from an original work of art, created to capture endearing portraits of playful kittens in nostalgic country settings. These are playing on a rocking chair. This plate is a part of an edition limited to 14 firing days and is available exclusively from the Hamilton Collection. It is Excellent/Mint condition. Comes with box & certificate.